Comfortable viewing angle : fitbit versa charger holds your Fitbit Versa safety with elegance, durability and fashion. Safety Protection Design : Multi-protect technology provides temperature control,overcurrent protection,overvoltage protection. Fitbit Versa Charger Specially designed for 2018 Fitbit Versa,Notice: only fit for Fitbit Versa, not for any other Fitbit model. Wall adapter is not included.And if you have a fitbit versa protector case on your watch,please take off your fitbit versa case when charging.The fitbit versa charger cradle can't work with a case on the watch. 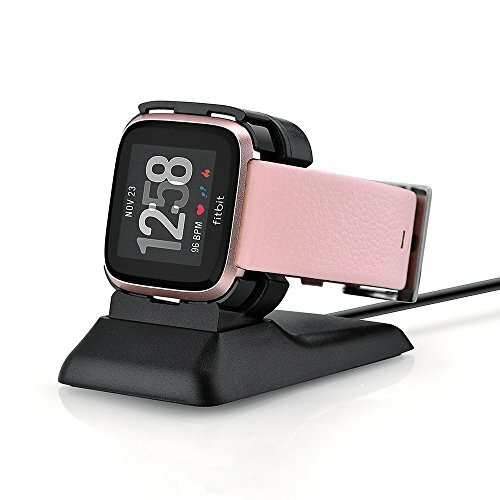 Easy to use, just plug your fitbit versa watch to the fitbit versa charging stand, and then connect the USB to PC or AC charger to get your watch charged.